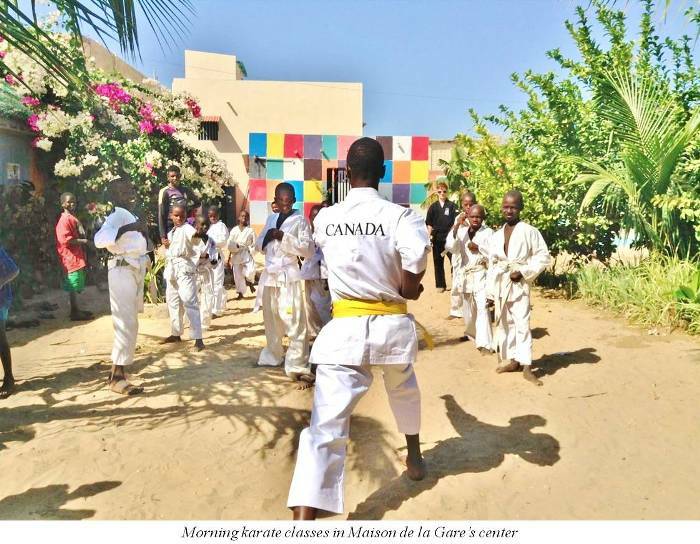 Early in 2015 Robbie, a young karate black belt volunteering with Maison de la Gare with his family, established a karate program for the talibé children of Maison de la Gare. He thought that the discipline, structure, self-confidence, sense of belonging to something special and respect among practitioners that is integral to the sport could greatly influence the talibés in a positive way. And, self defense skills could be a real advantage for vulnerable children forced to beg on the streets of Saint Louis. Robbie's family brought many dozens of gi (kimonos) from his dojo in Canada and he began teaching karate to the talibés. Local senseis in Saint Louis were engaged to continue the program, and many of the Maison de la Gare talibés fell in love with this sport. 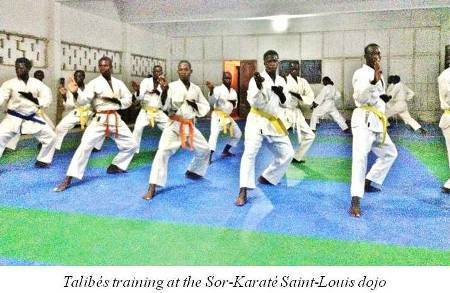 Karate is now taught at the Maison de la Gare centre three mornings a week by senseis from a local dojo, Sor-Karaté Saint-Louis. 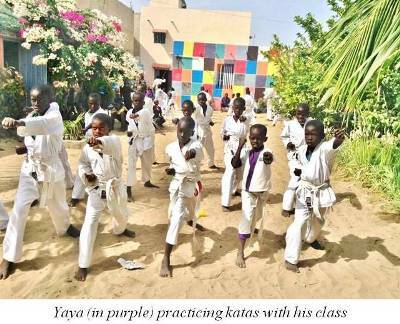 An average of about 30 talibé karate students attend each class, which is divided into beginner and advanced sessions. All students proudly wear their white gi and belts during class. Many more talibés sit on the side-lines, curious and perhaps imagining themselves in a clean, white gi as well. They too will be welcomed into class when they demonstrate interest. Most of the talibés who were registered at the dojo in March 2015 have progressed impressively and will soon be testing for orange belts. Issmaila, a "grand talibé" who assists instructing the Maison de la Gare morning karate classes, has recently earned his green belt. These "dojo talibés" train at the dojo most nights each week. For some, karate has become a consuming passion. One little boy, Yaya, seems particularly devoted, attending Maison de la Gare karate classes nearly every day. He takes karate very seriously and learns quickly. Yaya always wears a purple dinosaur gi, and refuses to relinquish it despite the fact that it is clearly too small for him. Yaya was recently promoted to the more advanced class. Issa Kouyaté, president of Maison de la Gare, will speak to Yaya's marabout about permitting him to be registered at the dojo with the older boys. Several of the more dedicated children in the advanced class have been identified for registration in the dojo. Thirteen year old Samba was initially registered at the dojo, but dropped out after a few months. Apparently his heels were injured and he could not practice. But, he is better now, and Samba has been re-registered at the dojo. Samba is proud of his new gi and keen to begin again and catch up to the other dojo talibés. Several of the Maison de la Gare "dojo talibés" have begun sparring and are ready for competition. However, equipment is lacking. At the dojo, one pair of kumite gloves was shared among all. When on a follow up visit Robbie joined the "dojo talibés" in training and offered his gloves for use, the kids took advantage of having two full sets of gloves and a series of sparring matches ensued. The talibé karate kids have seen some of Robbie's karate Bo staff competitions on YouTube, and they also want to learn this skill. Robbie and Mamadou found that broomsticks from the market serve fairly well as Bo staves, although they are a foot or two too short. Robbie's initial Bo lesson with Issmaila (see video) is a reminder of how eager and capable these kids are of learning quickly when they are motivated. The morning following Issmaila's introduction to the Bo, after karate classes, five children asked Robbie to teach them Bo as well. It later was noted that several broom heads were lying discarded, stripped of their broom handles which were now being used as Bo's. It is likely there is also a shovel head now missing its handle. 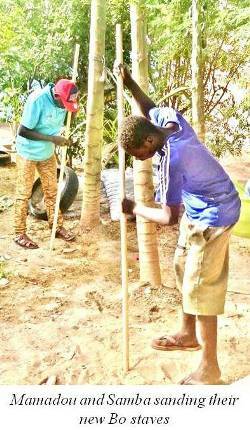 Mamadou discovered an alternative to broomsticks, and the talibé karate kids were soon at work sanding and perfecting their new Bos. 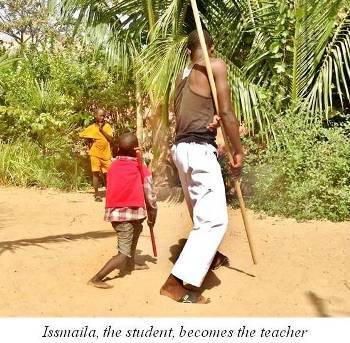 Issmaila is such a committed karate student, and such a fast learner, that he is now able (and very willing) to continue teaching the karate Bo lessons. 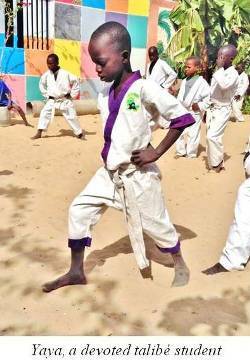 Karate is delivering astonishing benefits to many of the Maison de la Gare talibé children. And, for a few, a true and abiding passion has been sparked. Who knows where it may take them.